Catherine Haddad Staller's horses "got wheels" this summer. The Theault Morpheus provided by Stadium International Trucks. Greetings from Gladstone! I arrived with both my best horses on the East Coast of America just in time to experience our first hurricane. But as I sit here waiting for the last drizzles of Hurricane Irene to subside, I realize that I have seen the likes of her all over the world even though she is normally referred to as a rainstorm with some wind. A bit anti-climatical, this hurricane thing. Lets be thankful for that! The Boyz and I are trying to gear up for showing over the next few weeks. But it seems that every time I get both horses up and running, I am boarding a plane for the next clinic. I had another fabulous round of lessons at Randi Leoni’s Hawk Hollow Ranch in Bedminster, N.J., and I just got back from Jen Kaiser’s place in Lafayette, Ind. I really appreciate the professional organization at both places and the dedication and interest of the students! I’m packing bags for Denver this week after unfortunately having to cancel my clinic in Reno. Seems that Irene’s power over the East Coast airports was greater than her actual physical impact. In the meantime, I have been test-driving a wonderful horse van provided for me by Stadium International Trucks this summer. The van is produced by Theault and is similar to my van in Germany, but I like this one WAY better! Theault America has put together a two-horse truck with unparalleled stability, comfort and convenience. I can put two big horses on the truck and attach a horse trailer to bring along two more if I so desire. Without the trailer, the van is so handy that I can drive it to the grocery store and park it like a normal vehicle. I run errands in it. As for the stats on the two newest models of the Theault Morpheus just received by Stadium International, the truck is built on a Mercedes chassis with a V6 3.0L turbocharged diesel engine, 5 speed automatic, fully loaded with AC, airbags, CD player, sleeping bunks, changing room and more! My horses and I have never traveled in so much safety and style! 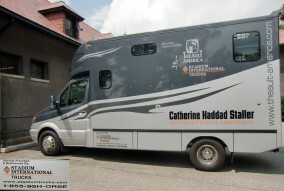 If you would like more information on these trucks, contact Mona Paradis (thanks, Mona, for giving my horses wheels this summer) at Stadium International Trucks in New York: mparadis@stadiumtrucks.com, or Theault America www.theault-america.com for general information. This truck gets ALL THUMBS UP FROM ME!!! See the video for more details on loading, unloading, sleeping quarters and the high tech monitor system. I’m Catherine Haddad Staller, and I’m saying it like it is from Gladstone, New Jersey. Training Tip of the Day: When your training is constantly interrupted by travel, take notes and make videos. Try to pick up where you left off when you get started again.